If polls are around the corner, can opinion polls be far behind? ABP News, Republic TV, and India Today decided to gauge the mood of the nation before the 2019 Lok Sabha elections — after a long time, Arnab Goswami (Republic TV) and Rajdeep Sardesai (India Today) finally agreed on something. Meanwhile, Karan Johar came out of the cold, literally, to speak news channels, including India Today’s Rahul Kanwal at Davos, Switzerland. And whatever was left of the Priyanka Gandhi’s entry into ‘active’ politics was mopped up by the likes of Zee News. Opinion polls have acquired such a bad name for incorrect predictions that news channels call them anything but polls. ABP News and Republic TV-C Voter seem to have carried out the same ‘National Approval Ratings’ – the findings were identical. The statistical projections had NDA at 233 seats, down by 103 seats from the 2014 Lok Sabha elections, UPA went up to 167 from just 60 seats after Modi’s magic five years ago. ‘Others’, comprising regional parties, are projected to win 143 seats, with the Mahagatbandhan of ‘Bua-Bhatija’ taking 51 seats in Uttar Pradesh. Verdict? It’s a hung verdict. On Repubic, Goswami and his panelists reflected this mood of the nation by speaking in English, Hindi, Bengali, Bhojpuri and Telugu. It began with a discussion on West Bengal. BJP spokesperson Gaurav Bhatia opened Pandora’s Box by mocking the Bengali accent of political analyst Garga Chatterjee, in Hindi. Chatterjee retaliated by responding in Bengali. Goswami tried to translate Bengali into English for uncomprehending viewers, when Yashwant Deshmukh, the C-Voter psephologist, broke out into Bhojpuri. That led Telugu Desam Party (TDP) spokesperson to assert his regional identity in Telugu. The light-hearted tenor of the debate suggested two possibilities: the panelists didn’t take the predictions seriously or were pleased by them. 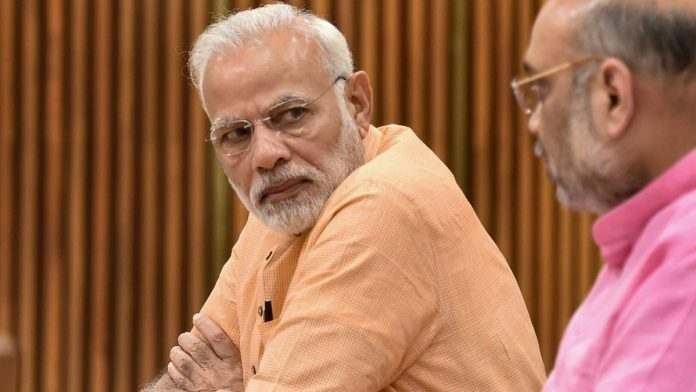 For a change, India Today agreed with Republic: the ‘Mood of the Nation’ (India Today-Karvy Insights) survey indicated a fractured mandate with BJP-led NDA, 237 seats, Congress-led UPA 166 seats and `Others’ — the ‘game changers’– with 140 seats. Ajit Jha, editor of Research India Today, summed up both polls: “It is a shocker…for BJP”. Karan Johar, Bollywood impresario, finally broke his silence regarding the Hardik Pandya-K.L. Rahul controversy following their distasteful comments on women during his chat show, Koffee with Karan (Star World). The players’ suspension following that episode was lifted Thursday. India Today anchor Rahul Kanwal interviewed him at the World Economic Forum, but not over a cup of coffee. Johar said: “… the statements that Hardik Pandya said (were) a bit inappropriate — I just want them to be back on field and play their games. He added that he had apologised to the players and they had accepted his apology. High profile business fraud is the lead of the day as “CBI books Chanda Kochhar for criminal conspiracy” (The Economic Times). However, the newspapers quote figures from different years on the amount ICICI Bank was cheated of. The Hindu and Express say that of the Rs 3,250 crore sanctioned, the bank was cheated of Rs 1,730 crore in 2012. TOI says it amounted to Rs 1,875 crore, and derived the figure from 2011. While the Kochhars dominate the headlines, Hindu leads with “Justice Sikri opts out of CBI chief appointment case” by recusing himself from the plea challenging M. Nageshwar Rao’s appointment as interim Central Bureau of Investigation (CBI) director. Other newspapers focus, instead, on “No decision on CBI chief, PM’s panel to meet again” (HT page 1). “The government is keen on a consensus candidate to head the CBI, given the controversies that have scarred the agency,” reports TOI on its front page flap, referring to the feud between former CBI director Alok Verma and Special Director Rakesh Asthana. Curiously, the Express carries the story on page 10 — perhaps due to a half page advertisement on page 5 which is actually page 1. That’s because Express has gone the way of TOI and HT with full page ads on pages 1-2, today. While all three carry Odisha’s KALIA scheme ads, TOI doesn’t get the Delhi Aam Aadmi Party government’s Public Works Department ad. Militant-turned-soldier Lance Naik Nazir Ahmad Wani is front page news with the announcement of his Ashok Chakra award, posthumously. He is “the first Kashmiri soldier to be awarded the Ashok Chakra, according to the army,” writes Express. There’s great variety on today’s opinion pages. TOI and HT have words of advice for the two national parties. HT, in “Different states, different plans”, writes that Priyanka Gandhi’s formal political debut in UP “reveals an aggressive hungry streak” in Congress. However, the dilemma for Congress “is to both regain its voters and ensure that the BJP is reduced to its narrower core,” it adds. ET looks ahead to next week’s budget in Parliament. It advises the government to “Stick to a Vote on Account on Feb 1” — “it should stick to convention and present direct tax changes. “It would be in the finer traditions of parliamentary democracy for the government to abjure last minute changes to taxation” that will far outlive the current Lok Sabha.